Real-time graphing is possible. 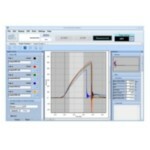 Force-time graphing software and force-displacement (FS curve) graphing software are available. Force-displacement graph is ideal for switch feeling testing or soft material testing since force-displacement relation is clearly visible. 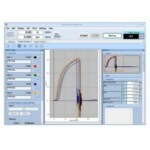 Software for data management of multiple force gauges is also available. Applicable models: ZTS, ZTA, eZT, HTGS, HTGA, DTXS, DTXA series. High sampling rate: 2000 data / sec (max). High sensitivity. Ideal for smooth real-time graphing. Compatible force gauges: ZTS,　ZTA,　eZT,　DSV,　DST,　HTGS,　HTGA,　DTXS,　DTXA. Manages data up to 4 pcs of force gauges simultaneously. Applicable models: DSV/DST, DS2, Z2/ZP, HTG2, and DTX2 series. A simple force time graphing software. Applicable models: ZTA, HTGA, DTXA. High sensitivity. 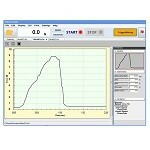 Ideal for smooth real-time force-displacement graphing. Suitable for switch tactile testing etc. Easy graph comparing. Applicable models: ZP, MTG, FRT, IPT200. Applicable model: FA Plus. Able to draw both force-time graph and force-displacement graph.